The name Episkopi means "home of the bishop" and comes from the fact that when the nearby site of Kourion (curium) was abandoned in the 7th century, the bishop moved his seat here. The greatest part of its area is included in the grounds of the British bases of Akrotiri & Episkopi. The archaeological findings, found in almost the entire area of the community, reveal that during ancient times Episkopi was connected to the city of Kourion. During the first centuries AD, Episkopi succeeded Kourion as a center of the region and a seat of bishops. The village has some rural accommodation and a decent village inn, not suprisingley called the Episkopi Village Inn. The archaeological Museum of Kourion is located at the centre of the Episkopi village community and is housed in a tow-level mansion that was built in 1937. This mansion was the residence of George McFadden who was the excavations' officer of the University Museum of Pennsylvania, which conducted excavations in the region of Kourion and in the area of the "Apollo Hylates" Temple (Apollo of the woods). After MacFadden's tragic death at the age of 43 (he drowned at "Lady's Mile beach on the 19th of April, 1953), the mansion was donated to the Antiquities Department of Cyprus -in accordance with the desires of the deceased. The building is magisterial, made out of stone, in folkloric architectural style, and with large internal and external arches. The large, external yard with three large cypress trees that lend beauty to the whole landscape is magnificent. In the building's first floor there are rooms that host the local and foreign archaeologists that come to conduct new excavations in the Kourion region. In the building's level floor are the office of the guard, a small kitchen, a room with a bath and toilets, and the two large rooms that contain antiquities from the various archaeological venues of Episkopi. In the West room there are exhibits from the Kourion region, the cemetery of St. Ermogenis, the "Kaloriziki" region, and the Early Christian Basilica. Some of its exhibits are the skeletons of victims from the great earthquake that occurred in the 4th century AD, the statue of the Child and the Dolphin (Roman Nymphaeum, Kourion 2nd century AD), ceramics from the Hellenistic era, golden and bronze jewels, various statues, and small pieces of mosaics. In the East room there are ceramics, clay pots, jewels, and some statuettes from the Temple of "Apollo Hylates", the cemetery of "Faneromeni", and the "Pamboula" region. Although of small size, the Museum of Kourion presents to the visitor all the findings of Kourion's archaeological area in an instructive and informative manner. 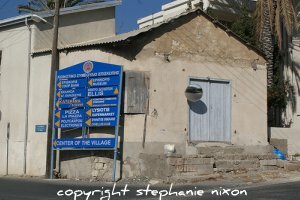 Continue on the main road for Episkopi Village and go right at the sign for the Police Station. Go left opposite the mosque signposted for Kourion Museum and drive through the old part of the village. Go left at the sign for Museum and take the left fork. The museum is on your left hand side. If you are in the village during the day, you are best off just popping into the Lysiotis Supermarket (prounounced Lyshottis)and picking up what you need. The village has a couple of cypriot coffee shops but you rarely see a tourist in there and you won't get lunch probably, just cyprus coffee, nescafe and probably not tea. Most people will head for the beach at Kourion (curium) and use one of the restaurants there. Evening time is a different story. Set around a courtyard, the epi village inn has been in business for years. Owned by a cypriot and his british wife, we always went there for something just a little bit more special than kebab. They provide a more international menu and the setting in the summer is just delightful and in the winter you have the added attraction of a wood burning fire inside to keep away the chills and provide atmosphere to your evening. Sadly there is almost nothing available online about the epi village in apart from the telephone number. Is it worth a visit?. Expect to pay a little more than usual but definately, give it a go if you are in the area. I would give them a call, particulary if you want a weekend booking. You will find the restaurant opposite the twin arches pub. You will find this lovely little restaurant on the old road between Erimi and Episkopi village. Just opposite the petrol station. A very small restaurant with most of the seats outside and you are quite close to the road but that will not detract from your enjoyment. It is relatively new, used to be someones house and they had the foresight to open it up as a restaurant. The food is good and very local and its a popular restaurant with ex-pats and cypriots. Again very little information available online. But worth a visit if you are in the area in the evening. We have been here quite a few times over the years and brought friends and relatives who liked it too.